The ultimate paintball experience can be yours with just a bit of planning. As one of Minnesota’s oldest paintball fields, we know what it takes to put on an epic paintball party. Read on for our best tips to have the ultimate paintball experience. The ultimate paintball experience starts with setting a date and time for your paintball party. Pick a couple of weekends and get with your friends to see which days work best for them. You’ll probably find that most of your friends’ schedules are fairly open if you’re planning 4 weeks ahead. 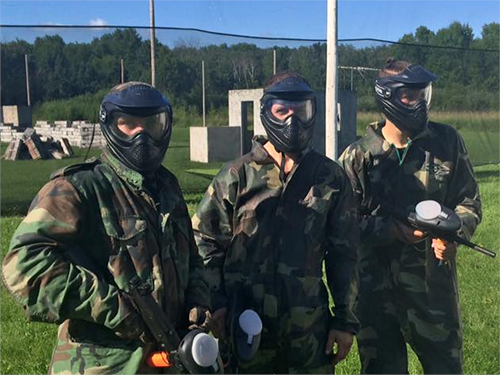 Saturday is the most popular day for paintball parties, with most parties arriving around 11AM-3PM. You’ll want to set aside 3-4 hours of play time for your party. Invite a bunch of friends and even casual acquaintances. Look through your facebook page and try to invite 20 or so people. Doing so will ensure a good turnout. You don’t need 20 players to have fun, but paintball is more fun when you have a larger crowd. Paintball seems to be on everybody’s bucket list, so you’ll probably find a lot of people who want to do it. For those that seem hesitant about playing, mention to them that you’ll be playing a low impact version of paintball. Low impact paintball is a new version of the game that’s designed to be painless. It’s great for new and timid players. You’ll want to make a reservation for your party. While we do accept walk-on parties, there’s a chance we may run short on equipment. Particularly during the busy spring and fall months. Make your reservation online and you’ll even save a bit of cash with our pre-pay option. There’s some paperwork that needs to be done before you can play paintball. You can fill out your waivers at the field, but we also offer an online version of our waiver. Filling out waivers online will speed up the check-in process. It will also make sure that anyone under the age of 18 will be able to play, if their parent isn’t going with them. Minors must have a parent or legal guardian sign their waiver. Grills are available for use at Action Packed Paintball. Add a picnic to your party and your ultimate paintball experience will be an all-day event. There’s nothing better than enjoying the great outdoors and the smell of burgers on the grill. On the day of your ultimate paintball experience, make sure you don’t forget anything important. Here’s our short list of things to take with you. Take a moment to check the weather report on the day of your paintball party. Is it going to be cold in the morning? If so, dress in layers. People have a tendency to overdress when playing paintball and they don’t realize they’re going to get hot. Put on a couple of light layers of clothing. Make sure one of those layers covers your arms and legs, as you’ll be playing some of your games in the woods. Footwear is important. Hiking boots are the preferred shoe for paintball. They provide ankle support and they’re usually water resistant. There’s nothing worse than stepping in a mud puddle and feeling your boot squish. If you don’t have hiking boots, wear a comfortable pair of sneakers. Don’t forget a hat. A baseball hat or even a winter hat will give your noggin’ some protection and keep the paint out of your hair. Bring a change of clothing with you for afterward. You’ll probably be a bit muddy at the end of the day. If you’re carpooling, your opponents will probably be covered in paint (courtesy of you). A fresh change of clothing and a rental jumpsuit will keep your car clean and keep the laundry challenges to a minimum. Don’t forget your grill stuff. Not only do you need to remember the food, you’ll also need charcoal, plates, cutlery, and grilling tools. Bring everything you’ll need to prepare your feast. We play paintball rain or shine, so be prepared if rain is in the forecast. Fortunately we do offer covered picnic areas, but you’ll still get a bit wet. Make sure you bring a change of clothes and an extra pair of shoes.